A teenager must fend for herself in an open air prison where cannibals reign. Every morning I open my email inbox to find a press release promoting some upcoming low budget horror movie. Understandably, there's a lot of hyperbole involved - even the laziest found footage knockoff will hype itself as the scariest experience since Paranormal Activity, or a mediocre zombie movie indistinguishable from the horde will declare itself a refreshing new take on the genre. That's fine. Film is subjective after all, and there may well be viewers who agree with such claims. What always annoys me however is when a yet to be released film's marketing declares it a 'cult movie'. Filmmakers don't get to decide if their film is a cult movie or not - that's for the audience, and usually history, to determine. Few filmmakers would really want their movies to attain cult status, as such a designation usually means they found a much smaller audience than originally intended. On the evidence of her two movies to date however, I can't help but feel Ana Lily Amirpour specifically sets out to make cult movies. Amirpour's debut, the 2014 Jarmuschian snoozer A Girl Walks Home Alone at Night, had an attention grabbing image at its core - that of a young Persian woman clad head to toe in a black chador, riding a skateboard in the darkness of night. Oh, and she was a vampire. But the black and white movie did nothing remotely interesting with this premise, and it played like a film specifically designed to play in the background in hipster cafes. Her sophomore feature, The Bad Batch, trades monochrome for colour, but suffers from all the same issues as her debut. Again it revolves around a striking image - a young Valley Girl type whose right arm and leg have been amputated. This is Arlen (Suki Waterhouse), whom we initially meet with a full set of appendages as she is released into what appears to be an open air prison, Escape From New York style, in the desert of the American SouthWest. It's not long before Arlen runs into trouble, captured by cannibals who lop off her arm and leg for a fry up. She makes her escape, rescuing a young girl in the process, and finds herself in Comfort, a community (which seems inspired by the Aussie post-apocalyptic thriller Dead-End Drive-In) run by a largely unrecognisable Keanu Reeves (elsewhere there's a turn by a completely unrecognisable Jim Carrey) as drug baron The Dream. Meanwhile, the father of the girl she rescued, Miami Man (Jason Momoa sporting the worst Cuban accent since Al Pacino in Scarface), is determined to retrieve his daughter. 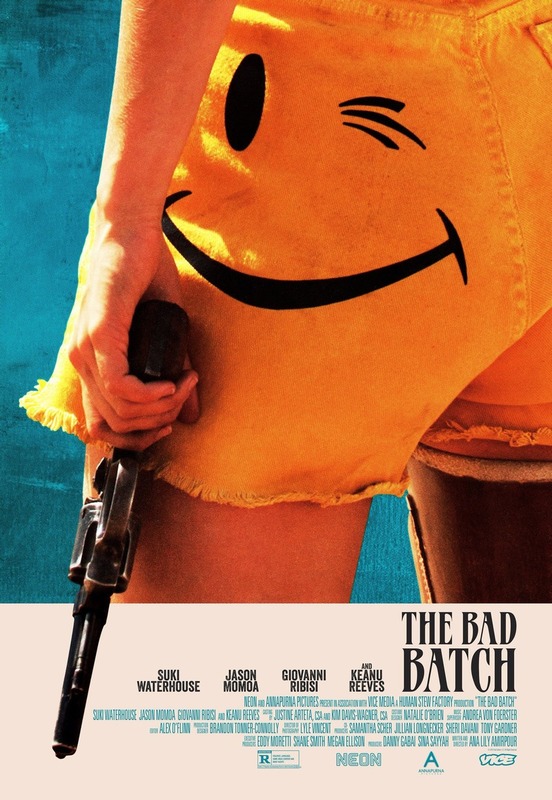 That brief summary makes The Bad Batch sound a lot more fun than it really is. At two hours, Amirpour's film is the very definition of a patience tester. Dialogue is minimal, which is usually something I commend, but here Amirpour fails to replace words with any interesting imagery, and there's little in the way of visual storytelling to get you hooked. Waterhouse does her best with her thinly sketched protagonist, but few will care what ultimately happens to the character. The biggest failing of The Bad Batch is that it's all constructed with far too much sanity. It seems inspired by genuine cult movies like Alejandro Jodorowsky's psychedelic western El Topo, but you're always aware it's the creation of a control freak rather than a genuine lunatic. Maybe Amirpour should have dropped some of The Dream's acid before arriving on set. The Bad Batch is on Netflix September 22nd.